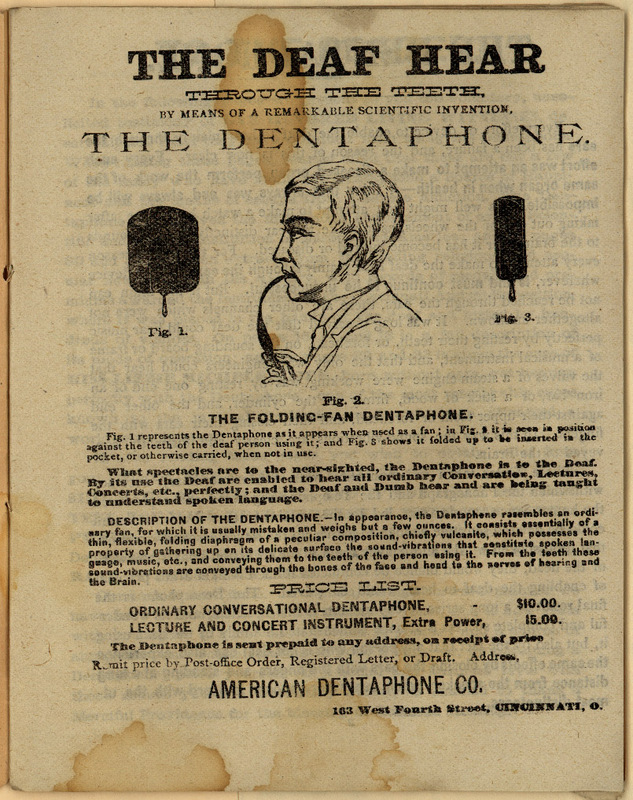 I was skimming through some very old vintage advertising materials from the 1880’s and came across the Dentaphone, a device that “by it’s use, the deaf are enabled to hear all ordinary conversations, lectures, concerts…” according to the advertising copy, the device is “a thin, flexible folding diaphragm of a peculiar composition, chiefly vulcanite, which possesses the property of gathering up on it’s delicate surface the sound vibratons that sensitute spoken language, music, etc., and conveying them to the teeth of the person using it.” Supposing the $10 or deluxe $15 vulcanite device fails to work for the user, not all was lost, because according to the advertising copy, when unfolded, it could also be used as an [expensive!] hand-fan. From Kenneth Samson, creator of the BiblioMarket blog that won DeafRead's Best New Blog of 2006, comes DeafSoup! DeafSoup bring you the stories you will not find elsewhere. Tired of the same old blogs with their recycled, repeated, unoriginal content? For a change of pace, read DeafSoup, with it's occasional, infrequent posts of a [mostly] historical nature, limited to topics and people I come across that spark my interest. Feel free to send me [samsonkg@gmail.com] interesting tidbits about lesser known deaf heroes, historical events, places & architecture, and so forth. I can't promise I'll always write about them, but i will research and read up about whatever you send. Learn American Sign Language like a ROCKET with Rocket Sign Language!